Home→Where does money come from? If an economy is going to use money, there has to be some—somebody has to supply it to the system. Where does the money we use come from originally? The answer to that depends on what kind of money it is. We actually have two major kinds of money in the U.S. and they come from two different sources. You’ve probably noticed that very few people use very much cash. Most “cash” transactions are done with debit cards, checks, or electronic transfers—number money. The money involved in these transactions is just account entries; no dollar bills or coins are involved. Though you can easily convert one kind of money to the other, these are actually two different forms of money that are created in completely different ways. 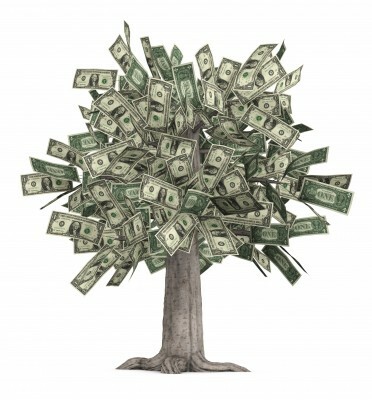 Only a very small percentage of the money in the U.S. is created by the government as cash. Most of the money both here and throughout the world is number money, and it comes from a system of banking called fractional reserve banking. Fractional reserve banking, as it was taught to many of us in school, is a system whereby a bank can lend out a portion of the money is has on deposit, keeping only a fraction of it as a reserve, hence the term “fractional reserve banking.” The reserve is intended to cover the occasions when people with deposits want to take the money back out of the bank. The rationale behind this is that most people will leave the money in the bank most of the time, so if all the money isn’t there, it won’t matter because enough will be there to satisfy the people who do want their money. What’s called a “run on the bank” is when the amount of cash depositors are trying to withdraw is greater than the amount the bank has available. Traditionally the fraction required for reserves is 10%. The bank can lend out 90% of the money it has on deposit. The idea, as it’s ordinarily understood, is that this system is beneficial to the community because while the depositors aren’t using their money, someone else can be using it to expand a business or buy a house. This is what we heard from Jimmy Stewart’s character in It’s a Wonderful Life. When there’s a run on the savings and loan, George Bailey says “You’re thinking of this place all wrong, as if I had the money back in a safe. The money’s not here. Your money’s in Joe’s house—that’s right next to yours—and in the Kennedy house and Mrs. Menklin’s house and a hundred others.” This is how it’s ordinarily understood—you’re not using the money right now, so someone else can use it and everyone benefits. However…this process of fractional reserve banking does something to the money supply. This system—just as it’s been taught, without any of the streamlining that leads people to say banks create money out of thin air—this system has a huge effect on the supply of money to the economy. 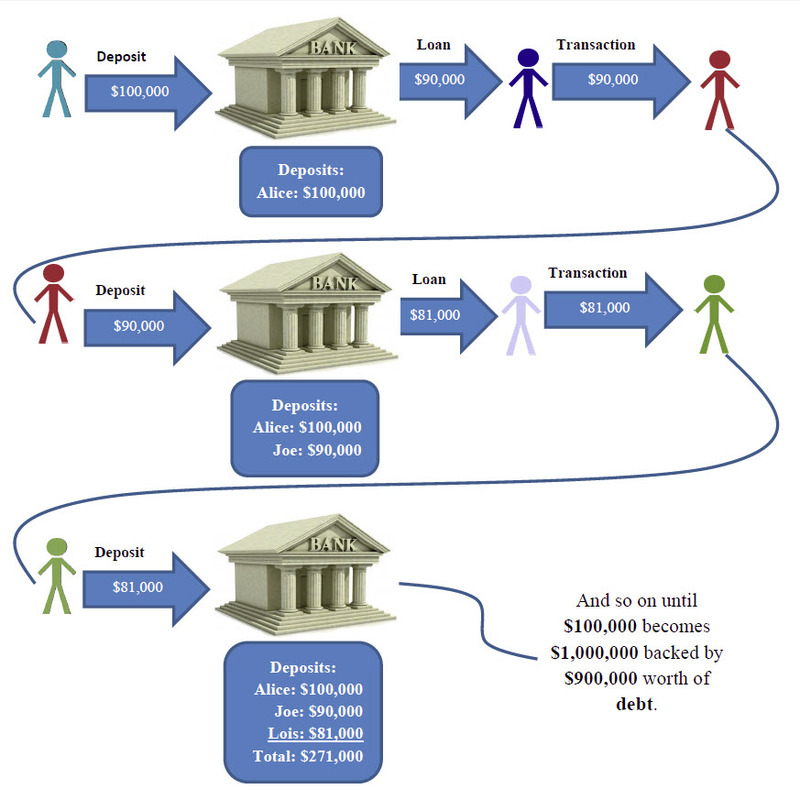 Following is a very simplified example of how fractional reserve banking creates new money. To demonstrate fractional reserve money, we’ll look at a simple theoretical example. We’ll lump all banks into one and just work with “the bank”. We start from zero and suppose that Alice comes into the bank and deposits $100,000 in currency. The bank now has $100,000 on deposit of which it can lend out 90% or $90,000. The bank lends $90,000 to Pete. Pete pays the $90,000 to Joe for a boat, and Joe, rather than carrying $90,000 around in a brief case or putting it under his mattress, deposits it in the bank. By these three steps, the money supply has gone from $100,000 to $271,000. 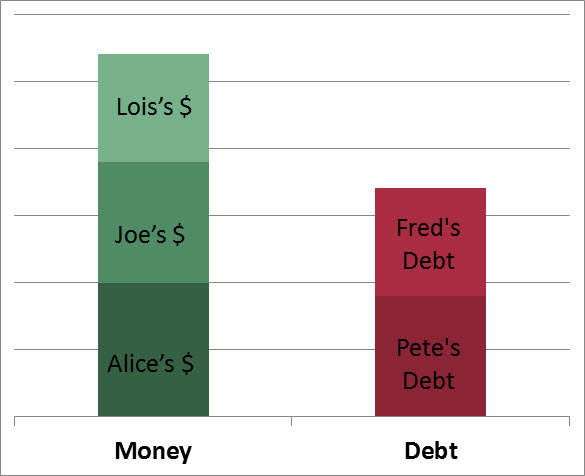 Note that Alice, Joe, and Lois all consider the money they have on account is their own money with no strings or debts attached. Pete and Fred may be making or not making monthly payments on their debts, but with regard to Joe’s and Lois’s deposits, that’s no concern of the bank and no concern of the account holders. As far as they’re concerned, that money is real money, free and clear. If you continue this process until the re-deposited amount gets down to near zero, eventually $100,000 currency turns into about $1,000,000. The process creates $900,000 of debt money out of $100,000 currency. 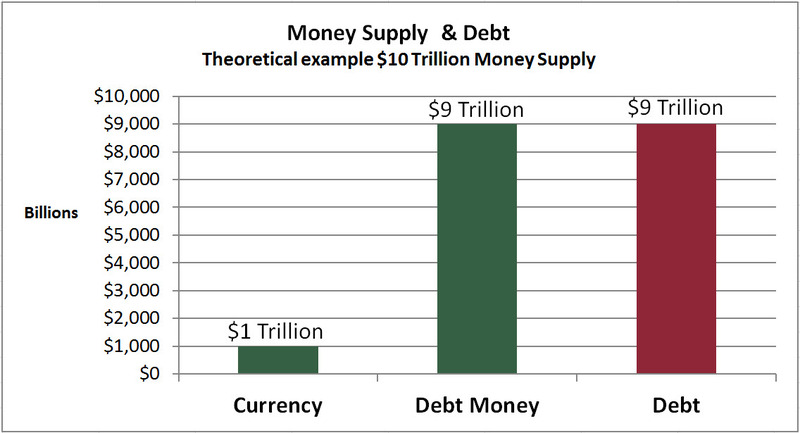 Thus we get a money supply that is 90% debt-based and 10% currency. There are a few major problems with this method of creating money. The most obvious is that it requires that people be in debt in order for the economy to have any money. What if people get tired of being in debt and start paying it off? When you repay a loan to a bank, the money is uncreated. The amount you pay on the principal doesn’t go into anyone’s account, not even the bank’s. It’s used to cancel that amount of debt and it ceases to be money. 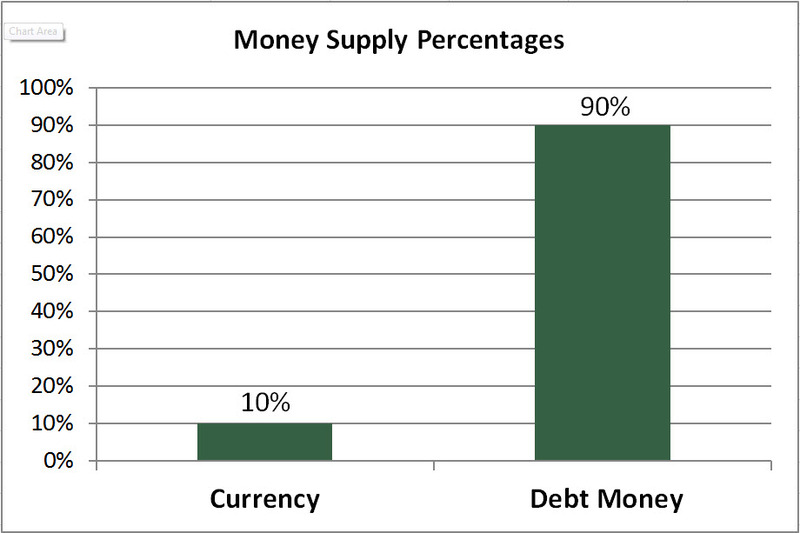 If we have a money supply that’s 90% debt-based, then everyone paying off their debts would extinguish 90% of available money. The way this is “solved” is by new loans being made all the time. There has to be continual borrowing just to keep the supply of money from shrinking. The example above is, of course, not precisely what happens. There are a couple of major differences between that and reality. The biggest difference is that when a bank makes a loan, they don’t generally give the borrower cash. They write a check or make an account entry. Number money. It works a little different than cash. If there’s a 10% reserve requirement, it means the banks have to maintain reserves equal to 10% of their customer deposits. The reserves can be either cash in their vault or money in their reserve account with the central bank. So, back to our example, when Alice comes in with her $100,000 cash, the bank makes an account entry that Alice has $100,000 on deposit, and they put $100,000 cash in the vault. Now…they could look at this on the basis that they have to hold onto at least $10,000 of that cash to cover the reserves for Alice’s deposit, and they’re free to lend out the rest. But they could also look at it another way. They have $100,000 cash in the vault, which is 10% of what? —a million dollars. And they only have $100,000 on deposit. Therefore they now have room for another $900,000 in deposits to still be within their reserve requirement. And they can create those deposits by making loans. This is how they look at it. So in the simplified example we were using, what they’d do is just plunk the $100,000 cash in the vault and start making loans till they reached $900,000. They don’t send the cash out the door and then wait for Joe and Lois to trundle back into the bank with briefcases full of cash. When they lend the $90,000 to Pete to pay to Joe for the boat, they just cut right to the chase and make a deposit entry in Joe’s account. The second major difference is that in the day to day operations of a bank, transactions are happening all the time. Money is coming in and money is going out. People make deposits and withdrawals, and the bank makes loans. Some transactions are in cash and some are number money. How then is the bank supposed to keep track of how much money they’re allowed to lend? In reality they don’t exactly bother keeping track of it. The loan officers don’t sit watching a computer screen waiting for vault cash to reach a certain level before making a loan. They just lend money according to whatever plan or promotional offer they have going at the time. At the end of the day or end of the week, the bank tallies up to see if they have reserves equaling the required percentage of their deposits. If they don’t have the required reserve amount to balance against the money they already “loaned” that wasn’t there, what they do to fix that is they borrow it. They borrow it from another bank that has excess reserves or they borrow it from the Federal Reserve Bank. So really for all practical purposes, the banks are creating new deposits out of nothing and then making the numbers meet the rules. When you go to a bank to get a mortgage loan, the bank is “lending” you money that doesn’t exist. It only comes into existence when you sign the agreement stating that you will pay it back and the bank makes the deposit entry in the designated account. Now it’s money. Yes, the banks are creating money out of nothing, but bear in mind that bank creation of money is contained in the core principle of fractional reserve banking per the It’s a Wonderful Life model. 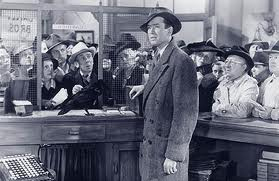 As soon as we say that George Bailey is allowed to take the depositors’ money out of the safe and lend it to Joe and Mrs. Menklin to buy their houses, we’ve given the banks the power to create money. All they’ve done when they create deposits out of nothing is the logical and efficient streamlining of the process. The banks are creating money that they can use by lending it out at interest, but they’re not creating money that they can just have–not exactly. Essentially they’re creating money that their customers can borrow from them and they can then borrow from their customers. Banks are in debt like everyone else, but they have some distinct advantages in the borrowing arrangements. They pay little or no interest and their IOUs are being used as money, which means most of their debt never needs to be repaid—at least not as long as the system keeps running. When a bank makes a loan, it creates an asset that earns a lot of interest and a liability that costs almost nothing. Also they can use their money-creation power to purchase other financial assets. When a bank buys a U.S. Treasury security, the process is very similar to what takes place with a mortgage loan. The bank creates a liability in the form of a check or deposit entry, and it receives an asset in the form of a U.S. Treasury security, which is essentially a loan agreement promising to pay back principal plus interest (like a mortgage loan agreement). This is not a good thing for the bank. The bank, of course, has some of its own cash or other assets against which there are no liabilities. In accounting this is called equity. (We’d see that if we were looking at a whole balance sheet and not just the little section that applies to our scenario.) As long as their total assets are still greater than their total liabilities they can absorb a few defaults and still be considered balanced or sound. But if a lot of their assets start abruptly losing value because of defaults, they can get into a situation where their total assets are less than their total liabilities. They have more debt than they could possibly pay, which is to say they’re insolvent. This is the point where they get swallowed by Morgan Chase or bailed out by the government. See The Debt-Based Economy for a look at the results of this money-creation system.